"Mountain of Light" redirects here. For the diamond, see Koh-i-Noor. "Cave of Hira" redirects here. For other uses, see Hira (disambiguation). Jabal an-Nour (Arabic: جَـبَـل ٱلـنُّـوْر‎, translit. Jabal an-Nūr, lit. 'Mountain of the Light' or 'Hill of the Illumination') is a mountain near Mecca in the Hejazi region of Saudi Arabia. The mountain houses the famed Grotto/Cave of Hira (Arabic: غَـار حِـرَاء‎, translit. Ġār Ḥirāʾ). The mountain and its cave hold tremendous significance for Muslims throughout the world, as the Islamic Nabī (Prophet) Muhammad is said to have spent a great deal of time in the cave meditating, and it is widely believed that it was here that he received his first revelation, which consisted of the first five ayats of Surah Al-Alaq from the angel Jibrā’īl (as is pronounced in certain Quran recitation schools and some Arab tribes; also known as Gabriel). It is one of the most popular tourist attractions in Makkah. The mountain itself is barely 640 m (2,100 ft) tall; nonetheless one to two hours are needed to make the strenuous hike to the cave. Its 1750 steps to the top, which can take anywhere between 25minutes to 1hr 30 minutes. Since this is where Muhammad (صلی اللہ علیہ وسلم) is said to have had his First Revelation and received the first verses of the Quran, the mountain was given the title Jabal an-Nūr ("Mountain of the Light" or "Mountain of the Enlightenment"). This experience is sometimes identified with the beginning of revelation; hence the present name. As for the exact date of the first revelation it can be seen through investigation to fix the time to Monday the 21st of Ramadan at night, i.e. August 10, 610 C.E., or exactly 40 lunar years, 6 months and 12 days of age, i.e. 39 Gregorian years, 3 months and 22 days. One physical feature that differentiates Jabal al-Nour from other mountains and hills is its unusual summit, which makes it look as if two mountains are on top of each other. The top of this mountain in the mountainous desert is one of the loneliest of places. However, the cave within, which faces the direction of the Kaaba (Arabic: كَـعْـبَـة‎, translit. Ka‘bah, 'Cube'), is even more isolated. While standing in the courtyard back then, people could only look over the surrounding rocks. Nowadays, people can see the surrounding rocks as well as buildings that are hundreds of meters below and hundreds of meters to many kilometers away. Hira is both without water or vegetation other than a few thorns. 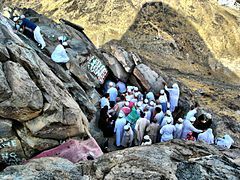 Hira is higher than Thabīr (Arabic: ثَـبِـيْـر‎),[a] and is crowned by a steep and slippery peak, which Muhammad with some companions once climbed. "Hira" redirects here. For the town of ancient Greece, see Hira (Greece). Taking 1750 walking steps to reach, the cave itself is about 3.7 m (12 ft) in length and 1.60 m (5 ft 3 in) in width. The cave is situated at a height of 270 m (890 ft). During the season of Ḥajj ('Pilgrimage'), an estimated five thousand visitors climb to the cave daily to see the place where Muhammad is believed to have received the first revelation of the Quran on the Night of Power by the angel Jibreel. The majority of Muslims do not consider visiting the cave as an integral part of the Hajj. Nonetheless many visit it for reasons of personal pleasure and spirituality, and though some consider it a place of worship, this view conflicts with Salafist interpretations of Islamic ritual. 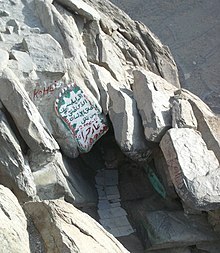 While the cave plays an important role in As-Sīrah an-Nabawiyyah (The Prophetic Biography), it is not considered as holy as other sites in Mecca, such as Al-Haram Mosque, and so under most interpretations of Islam, the same reward is received for praying here as any other place in Mecca. Before Muhammad's first revelation, he was said to have pleasant dreams. Among these dreams were signs that his Prophethood was starting to appear, and signs that the stones in Mecca would greet him with the Salaam. These dreams lasted for six months. An increasing need for solitude led Mohammed to seek seclusion and meditation in the rocky hills which surrounded Mecca. There he would retreat to the cave for one month, each year, engaging in taḥannuth (Arabic: الـتَـحَـنُّـث‎). [b] He would take provisions along with him during this retreat, and would feed the poor that would come to him. Then before returning home to his family for more provisions he would circumambulate the Kaaba seven times, or however many times Allah willed; then he would go home. ^ A peak in the area of Mina, Saudi Arabia. ^ It has a number of meanings, one of which is 'self-justification', as practised by the tribe of Quraysh during the Jāhiliyyah. ^ "Jabal al-Nour (The Mountain Of Light) and Ghar Hira (Cave of Hira)". 16 September 2015. ^ a b "In the Cave of Hira'". Witness-Pioneer. ^ a b Weir, T.H. ; Watt, W. Montgomery. "Ḥirāʾ". In Bearman,, P.; Bianquis,, Th. ; Bosworth,, C.E. ; van Donzel,, E.; Heinrichs, W.P. Encyclopaedia of Islam (2nd ed.). Brill Online. Retrieved 7 October 2013. ^ a b Mubārakpūrī, Ṣafī R. (1998). When the Moon Split. Riyadh. ^ Schadler, Peter (2017). "4". John of Damascus and Islam: Christian Heresiology and the Intellectual Background to Earliest Christian-Muslim Relations. Brill. p. 158. ISBN 9004356053. ^ Peterson, Daniel C. (2013). Muhammad, prophet of Allah. Grand Rapids, Mich.
^ a b al-Tabarī, Abū Ja'far Muhammad B. Jarīr, (1988). Watt, W. Montgomery; McDonald, M.V., eds. Ta'rīkh al-rusul wa'l-mulūk [The history of al-Tabarī]. 6. Albany, N.Y.: State University of New York Press.